When planning your wedding with LA Chefs at the Coast Hotel or other venue of your choice, you now have the flexible option of custom designing your own wedding menu and décor from a variety of options available, OR you have the option of selecting from one of our Three new and exciting Bridal Packages below. We have designed three levels of fully inclusive packages, to encompass and satisfy all budgets and all Wedding dreams. 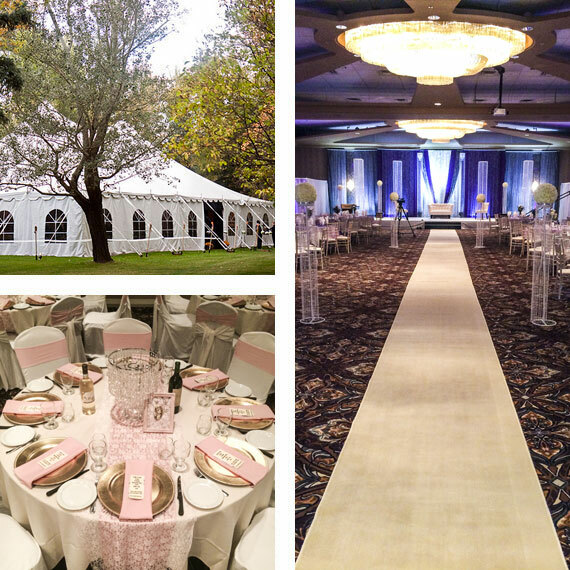 These packages make your wedding planning and budgeting easy, as the pricing includes absolutely EVERYTHING ~ the room, the food & beverages, the décor, and all other items and incidentals. Please note that all packages must be booked 3 months prior. These packages make your wedding planning and budgeting easy, as the price includes absolutely EVERYTHING ~ the room, the food & beverages, the décor, and all other items and incidentals. Please contact Alexandra (403) 320-7702 ext 29 ~ our highly experienced wedding consultant to discuss your dreams today! All packages must be booked 3 months prior to wedding date. Additional skirted tables available for Guest book, Cake, Gifts, etc. Additional skirted tables for Guest book, Cake, Gifts, etc.